I was more than a little bit surprised about this - I have a couple of series' to catch up on with Gossip Girl. 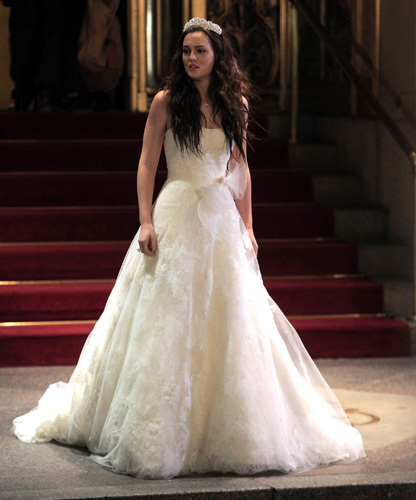 But it seems Blair Waldorf is all grown up - as actress Leighton Meester was spotted in New York filming her character's wedding to a French prince (could it BE any more cliche?). Guessing the dress is Vera Wang, seeming as though she endorses the perfume and seems to be wearing nothing else on the Upper East side these days. Have to give it to her, although it is very much a princess dress - I quite like it.